Asparagus has been revered for its medicinal properties since the time of the ancient Egyptians and ancient Greeks. The oldest known recipe book in the world contains a popular Roman recipe for cooking asparagus. Asparagus comes in different varieties that include the common green asparagus, white asparagus (traditionally grown in Europe) and purple asparagus. No matter the color, these different types of asparagus all have one thing in common: they’re some of the most nutritionally-rich vegetables on the planet. Loaded with vitamins and minerals, high in protein (for a vegetable) and low in fat, asparagus benefits your health in several ways. Looking for a low-calorie, low-fat veggie to add to your healthy recipes? Asparagus fits the bill! With only two grams of sugar and no fat (you read that right), it’s a filling side dish that won’t cause you to pile on the pounds. One cup of asparagus contains less than 30 calories. Folic acid is an essential vitamin necessary for red blood cell formation and healthy embryonic development. Because folic acid essentially guarantees that your body is producing new cells, doctors administer it as a supplement for women during pregnancy (x). Folic acid deficiencies could lead to anemia, fetal brain and spinal malformations, heart disease, chronic fatigue, weakness, and more (x)(x). Asparagus in rich in folic acid: one cup contains 39.7 micrograms of folic acid, or about 17 percent of your daily recommended value. Asparagus is a well-known natural diuretic, meaning it helps our bodies get rid of excess salt and fluid. This is especially beneficial for those suffering from edema (swelling in the limbs, hands, and feet) or high blood pressure. Because asparagus flushes toxins out of the kidneys, it can help prevent the formation of kidney stones and urinary tract infections (UTIs) (x). After you’ve eaten asparagus, you may have noticed it makes your urine smell odd. This slightly sulfuric smell comes from the naturally-occurring compound asparagusic acid, found in–you guessed it–asparagus (x). It’s not exactly pleasant, but it’s completely harmless. Asparagus is rich in potassium, which may help lower your blood pressure and improve your heart health. Studies show that potassium reduces blood pressure by excreting excess sodium (which can spike blood pressure) through the urine, and by relaxing blood vessels to promote healthy circulation (x). While research on humans is ongoing, animal studies show promise for asparagus as a natural way to reduce hypertension. In one study, researchers fed two groups of rats either a diet that included asparagus or a diet that did not. At the end of the study, the blood pressure count for the rats who regularly ate asparagus was 17 percent lower than the rats who did not (x). United States dietary guidelines suggest a minimum intake of 14 g of fiber per 1000 calories (x). That means that in a healthy 2000-calorie diet, you should consume at least 28 grams of fiber for proper digestion. One serving of asparagus (5 spears) provides 2 g of fiber, or 8 percent of your daily value. Eating a diet packed with fiber-rich foods helps prevent constipation, and improves the concentration of healthy bacteria in your gut that promote digestion (x). Fiber also has other benefits: studies show that it helps you feel fuller longer, reducing cravings and promoting weight loss (x). It may also lower blood pressure and support heart health, and could even fight diabetes (x)(x) (x). If you were living in Ancient Egypt or Ancient Rome, you would most likely eat asparagus raw. But as it grew in popularity, it became a cooked delicacy primarily for the wealthy and European royalty. Today, you don’t need to be a king or queen to add asparagus to your recipes. It’s usually prepared using only the upper part of the stalks. Asparagus is as versatile as it is healthy: you can sautée it in olive oil and spices, roast it, bake it, or grill it and pair it with a fresh source of protein like salmon or chicken. Adding an asparagus supplement to your nutrition routine can help you ensure you’re reaping all of its benefits. You can find it as a capsule, powder, or an extract. Asparagus extract powder contains a pure concentration of the vegetable’s beneficial compounds. As a dietary supplement, take 170 mg once or twice daily, or as directed by your physician. Because it’s very concentrated, you’ll need to use a milligram scale for accurate measurement. 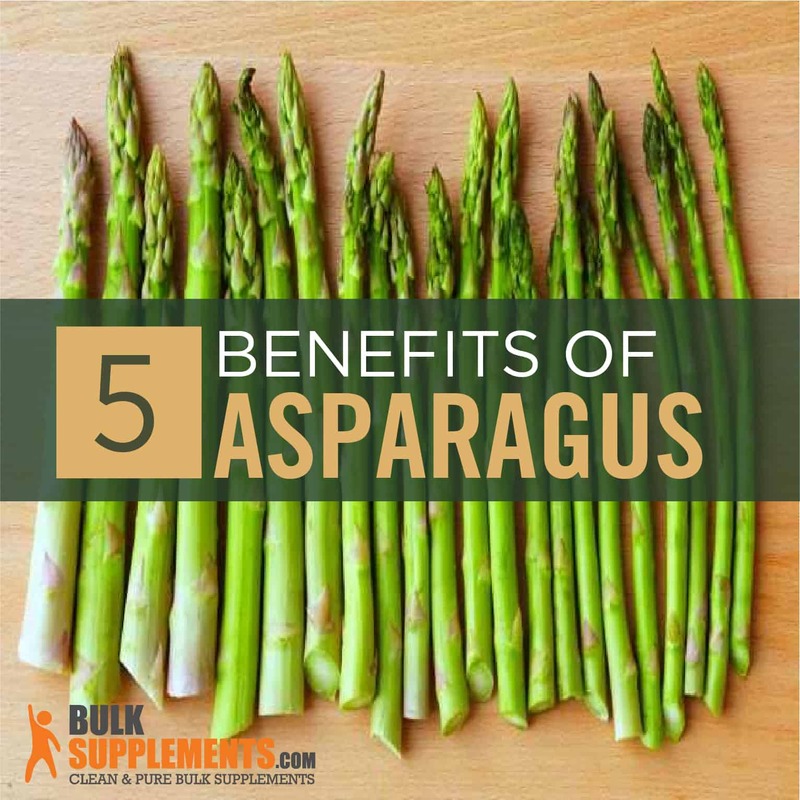 Asparagus is safe to eat and take as a supplement. However, if you’re allergic to onions, leeks, or other plants in the Liliaceae family, you should avoid asparagus. You can eat asparagus if you’re pregnant, but do not take asparagus supplements in medicinal amounts if you are nursing or pregnant, as it could negatively affect your hormones.